Note: The following article is not available to clients in the GCC. Over the past few decades, the UAE has positioned itself as the stable exception to the politically fraught Arab region: a safe haven for investment, capital and people. As many jokingly call it, the UAE is “Middle East-lite.” The UAE art scene has followed a similar story line. Conflicts in the Middle East since the Gulf War have caused major collections of Arab modernist paintings to be dispersed. Since 2008 many of these have been sold – either at auction or at fairs – in Dubai. Patrons such as Sultan Sooud Al Qassemi have assembled substantial collections, establishing a permanent home for Arabic modernism in the country and giving the UAE the role of Arab cultural safe haven. But as the contemporary art scene matures, it has become clear that the UAE art world is as globalized as its demographics – in some ways, exactly as globalized as its demographics. A key focus is emerging on South Asia, the region from which around 70 percent of Dubai’s population hails. Despite cultural and linguistic ties to Arab nations on the level of government, the grassroots art scene reflects a different reality. For example, this month [January], the Indian-born entrepreneur and art patron Smita Prabhakar, who has lived in Dubai for four decades, announced she was setting up Ishara Art Foundation in Dubai to exhibit and promote art from South Asia. Sheikha Hoor Al Qasimi, the influential head of the Sharjah Art Foundation, will curate the next Lahore Biennial, which is entering its second edition after an already rocky start. * Concrete, the Rem Koolhaas-designed multi-use site also in Dubai, is hosting this March an exhibition of Bangladeshi art curated by the Dhaka Art Summit. The winds, it may seem, are blowing from the east. Why this shift? On one level, it follows the arc of national interest toward South Asia. Last year, the UAE played host to Prime Minister Narendra Modi, celebrating India as one of the Emirates’ primary trading partners. Dubai also has been a safe haven for Pakistani business. One of the biggest names in the art world – Arif Naqvi, the embattled former head of the Abraaj Group – is a Pakistani national. There is a further impetus to look east because of the continuing Gulf dispute involving Qatar. Restrictions on trade and other exchanges imposed by Saudi Arabia, the UAE and others on Qatar – formerly a key cultural partner with substantial fine art holdings in private and state hands – has forced the art community to look wider afield. At the same time, the international focus of the UAE’s new art institutions is simply a more visible reflection of two facets that have always existed: a consistent outward orientation and the country’s diverse population. 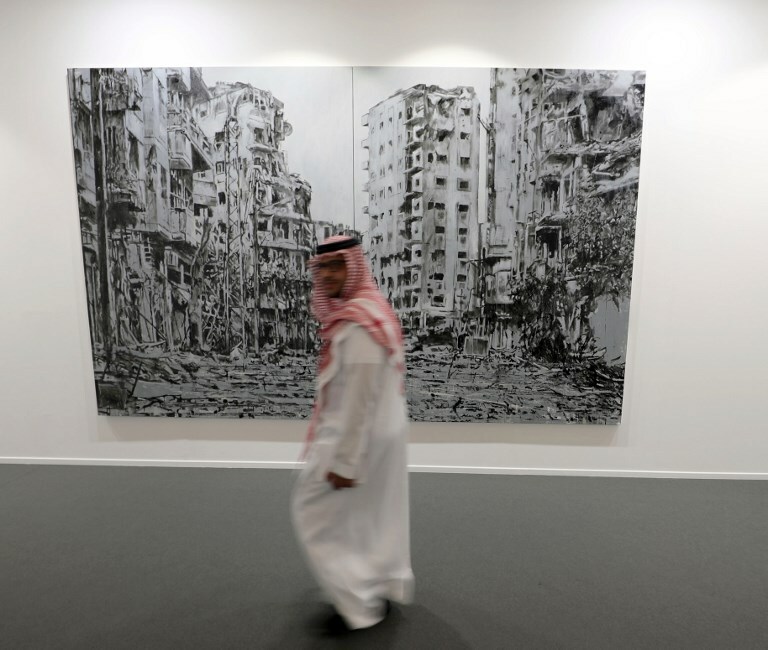 The UAE’s contemporary art offerings, such as the Sharjah Biennial, Art Dubai, the Global Art Forum and the Sharjah Art Foundation’s March Meetings, were until recently events catering toward a visiting audience. They took advantage of the UAE’s geographical position between Asia and Europe to pull in interested parties from around the world, often with the budget to cover flights and accommodation. Now, however, a number of art institutions are opening up across the UAE that reflect the growth in the local art audience and a maturity of the scene. These range from headline-grabbing museums such as Louvre Abu Dhabi to smaller not-for-profit foundations such as the Jameel Arts Center and the NYUAD Art Gallery. The Sharjah Art Foundation, which runs the Sharjah Biennial, recently pivoted to focus on year-round programming and is building a site for the permanent display of its extraordinary collection. These new institutions give a platform to the young art scene that didn’t exist before, elevating one particular focus that has existed somewhat below the radar: identity politics. Non-Emirati artists active in the UAE, even if they grew up here, do not have a path to citizenship, and often must cobble together short-term visa situations to live in the country they call home. As one recent collection of short stories by Deepak Unnikrishnan, an Indian who grew up in Abu Dhabi, puts it, the UAE is full of temporary people. These questions of national belonging have been particularly keen for the art scene. Though Emiratis have behind them governmental clout and funding, the art world, especially in Dubai, has emerged mostly independent of government investment. Key early players in the contemporary art world were raised in the UAE and then returned to the Emirates after studying abroad. In addition, the third-culture microcosm of Dubai chimes with questions of post-colonialism and globalization that have been important across the art world more generally. The rapidly developing art scene also reflects the internationalism of the UAE beyond South Asia. The Jameel Arts Center is run by a Saudi organization, and headed by a British citizen and longtime Dubai resident. Sheikha Hoor also recently established the Africa Institute, focusing on the links between the Gulf and North Africa. While the Saadiyat museums project of Louvre Abu Dhabi, the Sheikh Zayed National Museum and the Guggenheim Abu Dhabi (if it comes to fruition) is somewhat different, being government-led, it also visibly demonstrates the role of international expertise in building the country’s art scene. Indeed, as the years progress for the still-young country, the UAE seems to be surprised by the number of people who want to call it home. It might be politically unpopular to say that the UAE art world is not Arab, but its cultural institutions are beginning to tell just such a story. * Correction: A previous version of this story incorrectly stated that Sheikha Hoor Al Qasimi, head of the Sharjah Art Foundation, would curate the next Kochi-Muziris Biennial. In fact, she will curate the Lahore Biennial. Melissa Gronlund is a writer on art based in Abu Dhabi and London. Her writing has appeared in Artforum, L’Hebdo d’Art, BOMB, e-flux journal and The New Yorker, among other publications. She previously lectured on contemporary art at Oxford University’s Ruskin School of Drawing & Fine Art.